Much has been written about what it is like to be subjected to discrimination at work, on the street, within one’s own family or even via so-called “documentaries.” But I’d like to share what it’s like to have a celebrity—someone you have admired and been a fan of your whole life—suddenly and very publicly turn against you for no other reason than your religion. Ever had the experience of stroking a cat you love and the cat is purring away when it suddenly and viciously turns on you and scratches or bites your hand for no reason? Well, that’s how it feels, only much worse. Monty Python humor has often been compared to Marmite. Some people love it and others hate it. I think of it as a particular wavelength that not everyone can tune into. But I tuned into it immediately. I found it liberating. It was as if I had been given permission to laugh at formal, stiff, traditional things in life that I had never, up until then, even thought of questioning. Which is why, for me, it was much more than a silly TV show—it was a different way of looking at the world and it helped me see the ridiculous side of life, and it taught me not to take life too seriously. So for those, and many other reasons, Monty Python really is that important to me, which is why I decided, after my divorce in 2010, that my next ideal partner would have to be someone as infatuated with it as I was—it would be a match made in heaven. Having gotten nowhere “hanging around in bars,” I decided to set up my own Monty Python dating site! 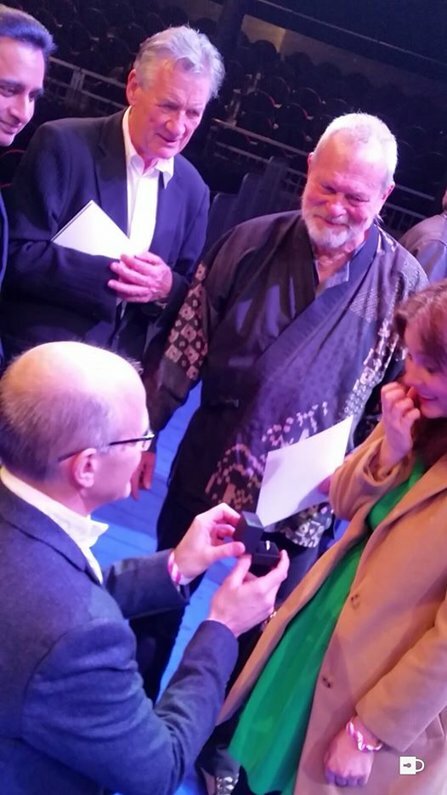 John Wood proposes to his girlfriend, Gemma, in front of two members of Monty Python in February. By that time, my Monty Python devotion was starting to get some media attention. In 2012, I won the British Film Institute’s competition to find the biggest Monty Python fan. In my entry, I explained that I’ve visited many Monty Python filming locations, gotten my name in the credits of an official Monty Python documentary (“Almost the Truth”); met and been photographed with all of the Pythons except Graham Chapman (who passed away in 1989); seen “Spamalot” 19 times and saw “Monty Python Live at the O2” four times, and that I was actively seeking a Monty Python mate. This was interesting to the media, and even more so when I actually set up the dating site called Pythonesque Dating. An article about it appeared in the UK national newspaper “The Sun.” A young lady called Gemma Harris happened to see the article and joined the site, and in February of this year, I proposed to her in front of Terry Gilliamand Michael Palin, two members of Monty Python. Gemma and I are currently planning our Monty-Python-themed wedding for October 5th, 2019—Monty Python’s 50th anniversary. 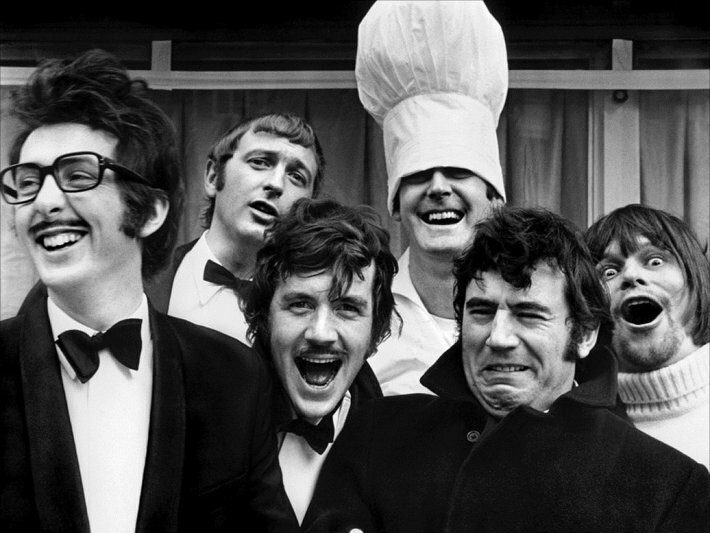 Over the course of all of this, I became the media’s go-to Monty Python fan and was interviewed by six different BBC radio stations regarding the group’s farewell show in London. Now that you understand what a genuine die-hard fan I am, imagine my excitement when, a few years ago, Eric engaged with me on Twitter and, soon after, invited me to be the coordinator for an official Monty Python book that I suggested! He told me to meet with the Python’s publisher to discuss the project, which I did, and he told me to get Terry Gilliam to design the cover, while he would be the proofreader. By this time, we had progressed to emailing each other and later, we found ourselves both at the same London event (John Cleese was selling his art to finance his astronomical alimony). I was hoping to speak to Eric there but he was engaged in conversation with Tim Rice and I didn’t want to interrupt, even though Eric’s wife kindly offered to introduce me. As it happens, I had met Eric previously at his “Not the Messiah” show at the Royal Albert Hall. Anyway, the next day, Eric emailed me to say he was sorry we never met up at the event. In other words, all was well—great, in fact—between us. 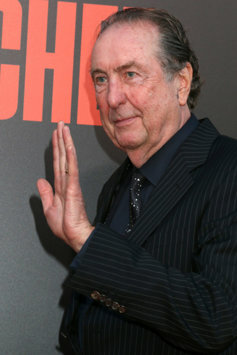 This is Eric Idle we’re talking about—the very person who taught me to question things and not take them at face value or just accept what everyone else says! To be different and not be a sheep… Why couldn’t he practice what he preached? 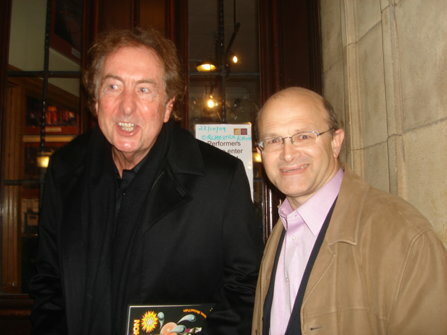 Eric Idle (right) and John Wood, October 2009. It was one of those moments that, for the rest of your life, you will never forget where you were when it happened. I was lying on my bed checking my phone when I got the message. I was devastated. How do you cope with being a lifelong, die-hard fan of somebody, then actually pulling off getting to know them… only to have them suddenly turn on you like that? I don’t mind telling you that for about three months, I was a bit shaken up by the experience. It was a confusing time because nothing could ever take away, for me, the magic of Monty Python sketches, albums, books and films, and yet one of the team now hated me on a personal level, purely for my religion (or what he thought it was). Man, that was a tough one. Eric is revered as a brilliantly clever writer, responsible for such masterpieces as his Monty Python monologues, the “Nudge, Nudge” sketch and of course “Spamalot.” Sadly, in his tweets above, he appears to have descended into neo-Nazi hatespeak. I couldn’t get my head around the fact that Eric was obviously a highly intelligent man, so why wasn’t he able to look at Scientology in an intelligent way—to separate the lies and rumors from actual fact? It’s clear he’s convinced that Scientology is something diametrically opposed to what it really is. But this is Eric Idle we’re talking about—the very person who taught me to question things and not take them at face value or just accept what everyone else says! To be different and not be a sheep. (The same thing Scientology teaches you, by the way.) Why couldn’t he practice what he preached? So I did the only thing I could: I decided to separate the man from the performer in my mind. That helped. I realized he has simply bought the bigotry, uninspected—which I found so disappointing—but I wasn’t going to let that get in the way of my never-ending enjoyment of Monty Python itself. Eric, without a doubt, Monty Python and Spamalot make people happy—your message is even “always look on the bright side of life.” The relentless laughter throughout Spamalot every time I’ve seen the show and the happy smiling faces of the audience as they leave the auditorium is testament to that. But the antipathy you have expressed toward me just because of what you think Scientology is, is ugly and had quite the opposite effect on me and the many others who witnessed it. It breaks my heart. I hoped you would be smarter and bigger than that. John lives in East Grinstead where he runs his own social media management company and volunteers in the fields of drug prevention and rehabilitation. His father, Leonard Berney, liberated Bergen Belsen Concentration Camp and his stepfather, Kenneth Wood, invented the Kenwood Chef food mixer.